I previously mentioned my love of Curry Express in the Murray Hill (Curry Hill) neighborhood in Manhattan. 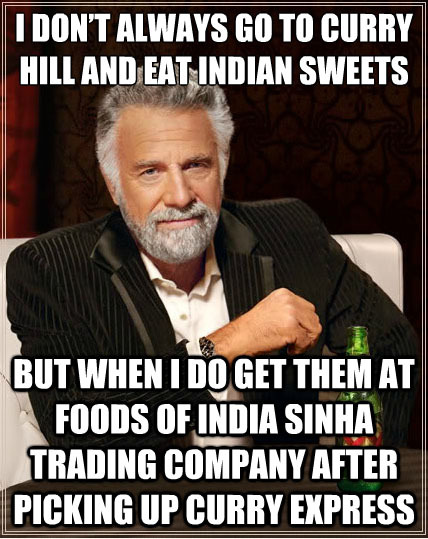 I’ve just added another stop to that for their excellent Indian Sweets: Foods of Sinha. I like getting sweets at Foods of Sinha because the store is an unassuming walkdown and not overrun with people like Kalustyan’s can be. The owners are very helpful. The store has all your standard Indian items with generally lower prices than some of the other stores. I can also pick up some of my favorite snack mixes at reasonable prices there. Pictured are Motechoor Ladoos and Almond Burfees. The almond burfee is rich with a nice cross between moist and grainy. The motechoor had a great consistency though some may find it to be a little too sweet. Since I have ladoos once a year or so I’m okay with it. Like any sweet, they’re fantastic with a warm cup of coffee or tea. The aforementioned don’t contain gluten but are made in a facility that processes wheat.